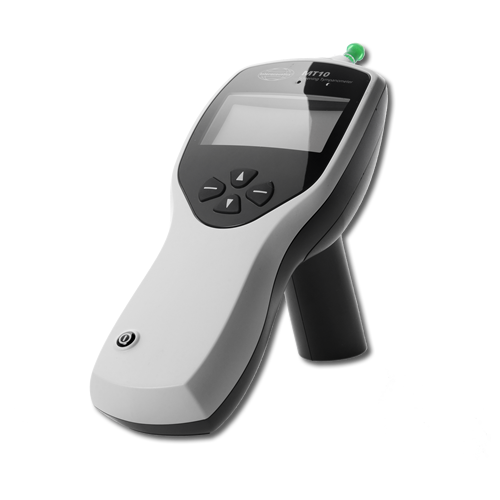 Lightweight and easy to use, the Interacoustics MT10 is a handheld portable tympanometer that provides reliable results in a cost-effective manner. This Interacoustics tympanometer can test four ipsilateral reflexes at different frequencies per ear, with either manual or automatic intensity selection. Analysis performed: Compliance peak level (in ml). Pressure of same; Gradient (in daPa); Ear Canal Volume (ECV) @ 200 daPa. Probe tone levels and accuracy: 226Hz +/-2%; 85dB SPL +/-2dB over range 0.2ml to 5 ml. Pressure levels and accuracy: +200daPa to -400 daPa +/-10daPa or +/-10% (whichever is larger) over range. Ear volume measurement rang and accuracy: 0.2ml to 5ml +/-0.1ml or +/-5% (whichever is larger) over entire range. Sweep speed: Typically 200-300daPa/sec; dependant on ear&cavity volume.